1. Die cut tag from watercolor paper. 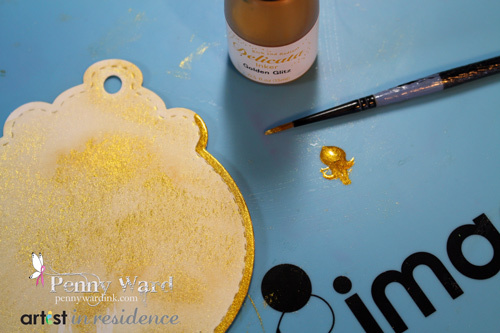 Using Delicata Golden Glitz reinker and a paintbrush, give the tag a shimmery wash of golden goodness. Let dry. 2. 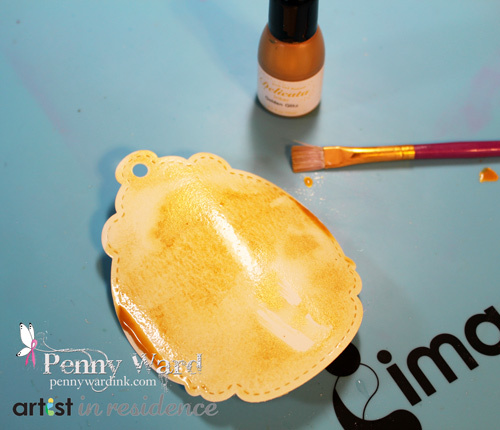 On the edge of the tag, paint just past the “stitching” with Delicata Golden Glitz reinker and a paintbrush. Let dry. 3. 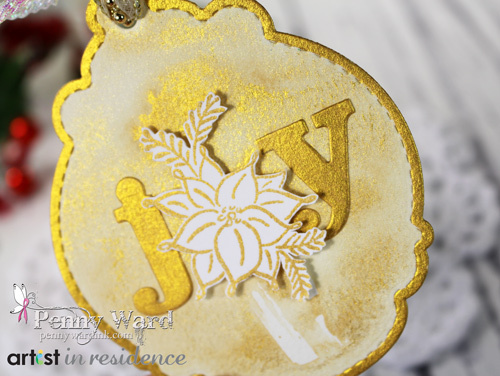 Die cut the word JOY from White cardstock, ink with a Delicata Golden Glitz ink pad. Let dry. Stamp small Poinsettia cluster onto White cardstock with the same ink pad, trim. 4. Adhere sentiment to tag. Adhere Poinsettia with foam adhesive as shown. Finish tag by adding sheer ribbons and tying into a bow.